Evaluate, reevaluate and then reevaluate some more. I’m overweight. Just typing that conjures up a package of less-than-pleasant feelings and concerns. Am I at risk of diabetes? Is there a physical inactivity–related disease lurking around the corner? The important first step in any attempt at lifestyle change involves knowing where you currently stand. To change, you have to know what you’re changing. Many people, especially those of us who are overweight or obese, tend to underestimate how poorly we’re eating or overestimate how much we’re moving on a daily basis. As you will see, I certainly did. So, before moving forward, I had to take an honest look at my own habits. I had to ask myself, what am I really eating? How am I really moving my body? Before diving into this project, I created a 14-day food and exercise journal. That’s enough time to balance out some highs and lows and give a good representation of how I typically eat. I started with total calories, comparing my actual caloric intake to my goal intake of 2,500 calories per day. In my first two weeks, from a calorie standpoint, I didn’t do too bad. In fact, I was either below or within 100 calories of my target on nine of the 13 days. The most calories I ate was on day 5, with 2,865 calories. The one day I didn’t count calories on was day seven for one simple reason: life got in the way. I recorded my breakfast and lunch, but then went out to dinner after being snowed in for three days. Dining out can make it very difficult to know exactly what you consume. How much complimentary bread did I really eat? What exactly is in that sauce? What about the drinks? How big are the portion sizes of the meal? Eating at restaurants is an important social element in most of our lives and I knew that there was no way I would be staying out of restaurants for the next 12 months. Most people wouldn’t. After I realized I couldn’t really estimate how much I ate that night, I decided I’d better devise a plan to eat more intelligently when I go out in the future. Next I looked at my carbohydrate, fat and protein (collectively known as macronutrients) consumption. With the exception of two days, I fell below my 50 percent carbohydrate target each day. My protein intake told a similar story, with my intake being below the 30 percent target on all but one day. Now, I’m no nutritionist, but I feel bad news on the horizon. If my carbohydrate and protein percentages were low, that can only mean one thing — I was consuming too much fat. I came close a few times, but never actually got down to the goal of only 20 percent of my diet being from fat. Prior to doing this exercise, I never would have guessed that my diet was this high in fat. While I knew that what I was eating before I started this journey didn’t align with the Dietary Guidelines for Americans, I was surprised to learn that I was almost exactly on target with my total caloric consumption, but I was eating 36 more grams of fat each day than I should be. This may not sound like much, but 36 grams of fat equals 324 calories of extra fat each day. As you can see, it’s vital to know your current habits before trying to establish new ones because what you’re doing every day may not be what you think you’re doing. Prior to this exercise, I had no idea what it would take to have fat be only 20 percent of my total calories. Now I know that it’s not necessarily the amount of food I’m eating, but the types of food I choose. If I can find a way to replace some fat with protein and carbohydrate while keeping my total calorie intake steady, I will be well on my way to meeting my initial goals. I learned some big lessons during these 14 days, the most important of which was that I was more than capable of eating well one day at a time. Consistency was my problem. I needed to develop some tools and skills to turn one or two good days per week into three or four, eventually leading to me making the right nutrition choices the majority of the time. 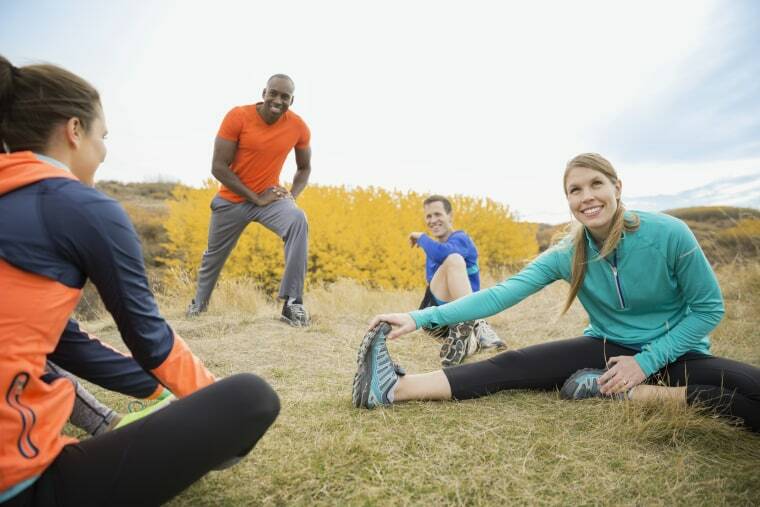 When it comes to exercise, the conversation is much simpler. The Physical Activity Guidelines recommend you perform at least 150 minutes per week of moderate-intensity aerobic physical activity, as well as two or three muscle-strengthening activities each week that are moderate or high intensity and involve all major muscles groups. In other words, I need to do at least five 30-minute cardio bouts and two full-body resistance-training sessions. That’s seven workouts a week. In order to give myself a day off each week, I will either have to double up one day and do both cardio and strength or extend those cardio sessions to at least 38 minutes each, which would cut the number of workouts down to four. During this two-week baseline period, I performed about 60 minutes of cardio each week, falling far short of my goal. I also performed three sessions over the two weeks where I did core-strengthening work and flexibility training, along with a few strengthening exercises. The week before beginning this project, I visited my doctor, who ordered some blood work so we could establish a baseline against which to compare any future progress. The results of my physical exam were not ideal, which wasn’t surprising. My body mass index (BMI) was 37, which put me in the Grade II Obesity category, and my blood pressure was at the low end of the prehypertension category. When it came to my bloodwork, there were four areas of concern. Total cholesterol, triglycerides, HDL (high-density lipoprotein, also referred to as the “good cholesterol”), and HDL risk factor. All were elevated except my HDL, which was too low. In addition, my hemoglobin A1c level—a test commonly used to screen for diabetes — was slightly higher than it should be. There was also concern about elevated enzyme levels that might indicate that I have fatty liver — one of the many risks associated with abdominal obesity that have been a concern for me in the past. The next day, I had 90-minute session with my personal trainer. My trainer took skinfold measurements, which revealed that my body-fat percentage is 26.9%. Anything above 25% is considered obese. The trainer also took a series of circumference measurements at the hips, waist, abdomen, biceps, chest and thigh. Finally, I completed a series of physiological assessments that measure muscular endurance and involve simply doing as many repetitions as you can with good form. These tests came with some ups and downs. I scored “good” and “excellent” for push-ups and squats, respectively, but I was in the “poor” category for curl-ups and the 1-mile walk test. Knowing where you stand is essential for two reasons. First, you can’t know what changes you need to make to your diet or exercise regimen to improve your health and overall well-being if you can’t honestly assess what you’ve done to become overweight in the first place. Second, having a way to measure success is key. If the bathroom scale is your only means of tracking progress, frustration is almost certain. After a few months, you may find that you’ve hit a frustrating weight-loss plateau. But if you know that your clothes fit differently, that your waist circumference has gone down by three centimeters, or you can do six more push-ups than you could at baseline, then you can find small victories to help keep you motivated. How to Lose Weight - For Good! I went to bed on January 31, 2017, knowing that I would start changing my life first thing the next morning— and I meant it this time! Without exception, everyone I told about this project looked at me like I was a bit nuts, including my wife, my friends and my doctor. It’s a huge challenge, especially for someone who has made very few genuine efforts to lose weight before, but I’m ready. Wish me luck… and join me. I’m proud that NBC BETTER invited me to share my journey every two weeks with you through the completion of The Lifestyle Project and beyond,and now I want to hear from you. Have questions about my journey? Ask me on Twitter from noon to 1 p.m. EST Thursday, September 7. Daniel J. Green, a writer and editor based in Asheville, NC, currently serves as Senior Editorial Consultant for the American Council on Exercise.